In the lead-up to the UNFCCC Conference of Parties (COP) in Paris, there was a lot of buzz in the mainstream business press about the need for research and development that could lead to breakthroughs in the cost of clean energy technologies. Over the summer, Financial Times commentator Martin Wolf called for a “moonshot to save the planet” building upon the proposal by leading academics and senior industry executives for an “Apollo mission” to put the brakes on climate change. Similarly, along with a handful of the world’s billionaires, Bill Gates announced that he would be investing at least $2 billion over the next five years in renewable energy, while imploring governments to spend tens of billions more on renewables R&D. Yet much of the conventional wisdom about renewables is wrong. We’ve already had an Apollo project for renewables and fortunately, the moon landing was a success. There is big news that’s not getting enough attention: in a lot of places, renewable energy has already gotten cheaper than fossil fuels. 2014 saw a surge of 17% in global green energy investment to $270 billion. The uptick is remarkable considering the downwards trend of the previous years and the rapid fall in the price of oil and natural gas. But 2014 was also the year that finally saw a decoupling of decreasing oil prices and renewable energy investment. The break-out move for the green energy sector is due to continued cost reductions and the rise of utility-scale renewable energy projects. In solar PV, project developers are delivering electricity to consumers at half the price of just 5 years ago. The Paris meeting in December 2015 will be very different from every COP before it because as of today, it is cheaper to make electricity from the sun and the wind than from fossil fuels in many countries around the world. That may sound like a lot of hot air, so let’s look at the facts. Project developers in sunny places like Jordan and India have been winning government tenders for renewable energy with prices so low they’ve shocked even experienced observers. How about less than GBP 40/MWh for solar power (less than a third of the average price of electricity price in the UK)? It’s happened in Saudi Arabia and there’s more record-shattering developments in the renewable energy pipeline. How about less than GBP 20/MWh for wind power? That’s the average price for onshore wind projects in the United States during 2014, which has been achieved on the back of economies of scale that will translate into real savings on future projects across the world. Of course, back in cloudy Europe, less sun intensity translates into a higher cost of solar energy. But even here, a disruption to the utility business model prompted by cheap renewables, is taking shape. For example Spain – once a global leader in renewables – have enacted laws to stop the growth of new renewable energy capacity. Policy makers in Spain set out with a supportive approach to renewables in the early 90’s. But investors were guaranteed tariffs that were too high, which eventually proved to be expensive and unsustainable. The solution was to make retroactive changes to the tariff structure, an action that has attracted a flood of lawsuits from international and domestic investors. Yet complaining about retroactive cuts to tariffs is a bit like crying over spilled milk. Roof-top solar electricity in most parts of Spain and other parts of Southern Europe is now cheaper than electricity from the grid. In a free-market, this would lead to customers reducing the amount they take from the grid, or abandoning the grid altogether. But electricity is not a free market, one must play by the rules – and many of those rules continue to be stacked against renewable energy in favour of conventional forms of energy. These rules need to change, but, in the meantime, the solar tsunami will push on. Incremental innovation in the manufacturing process for solar PV along with greater scale will continue to push the price of solar energy lower over the coming years. The error in conventional wisdom about renewables is the idea that cheap, clean energy requires a great scientific discovery to achieve. Research and development can play a vital role in next generation solar, and essential enablers such as energy storage and smart grids. However, for many parts of the world, the future is already here. It’s time to recognize that some renewable energy technologies are already delivering cheap, reliable and clean energy as a result of more than 40 years of progress within the industry. What’s needed even more than science and technology is the political will to create a level playing field for renewables and enable access to the same sources of financing that have been used by the fossil fuel industry to dominate energy markets. Given the limited time left to slow the rate of climate change, the world does indeed need a moonshot to save the planet, but with the big rockets in orbit, it’s time now for the private sector to complete the mission. Rather than the technology costs holding the private sector back, the following figure shows the breakdown (capital, O&M, financing and tax) in 2015 of power plant costs across regions and technologies. 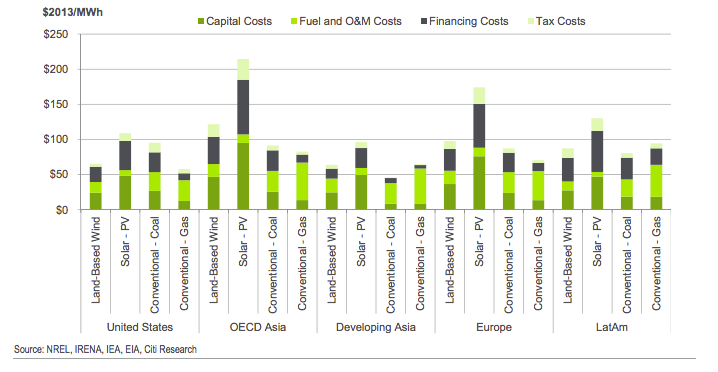 Indeed it suggests that financing costs are a significant portion of overall costs for renewables, particularly in developing countries with high cost of capital.